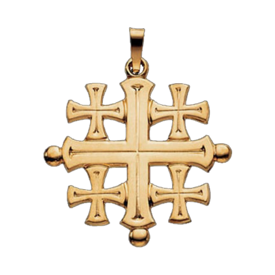 Simple Cross Pendant. 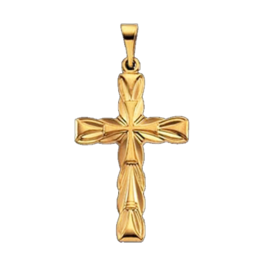 14k Yellow or White Gold simple cross. This cross is available in 3 sizes. Price shown is for the 17mm in length by 11.5mm across. Next size is 20mm by 13.7mm and the large is 23mm by 16mm. 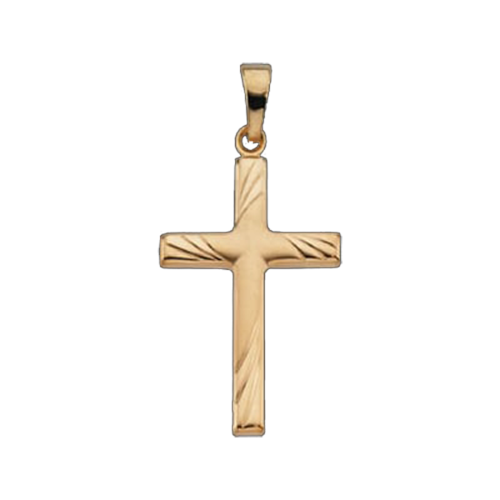 This popular gold cross is a great gift idea. 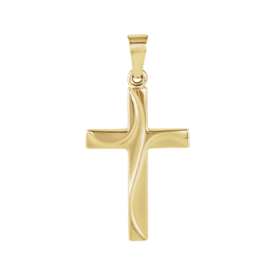 Gold Swirl Cross Pendant. 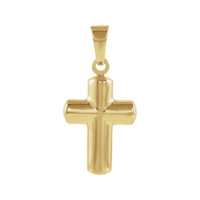 Fancy Gold Cross pendant, available in 14k White or Yellow gold. Cross measures 21mm in length by 14mm across. You will love the design on this cross. Fancy Cross. 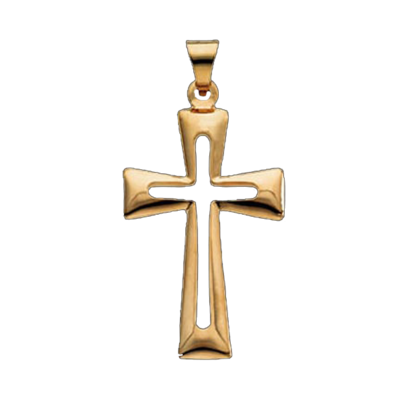 Pretty 14k Gold cross pendant. 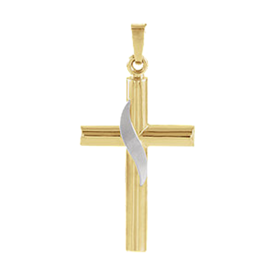 Cross measures 24mm in length by 16mm across, available in 14k Yellow or White gold. Very nice cross. Two Tone Cross. 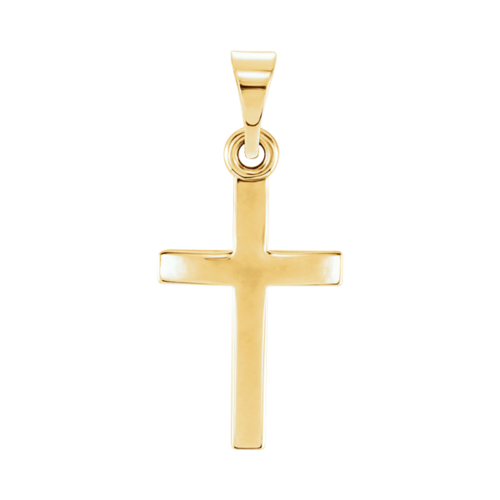 Lovely 14K Gold Two Tone Cross. 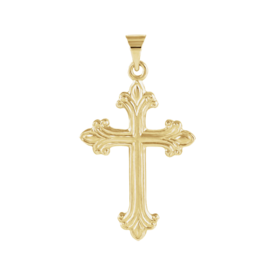 This attractive cross is hollow and available in 2 sizes, 20.5mm by 14mm and a larger 25mm x 16mm. Small Gold Cross. 14k Yellow Gold Cross pendant. 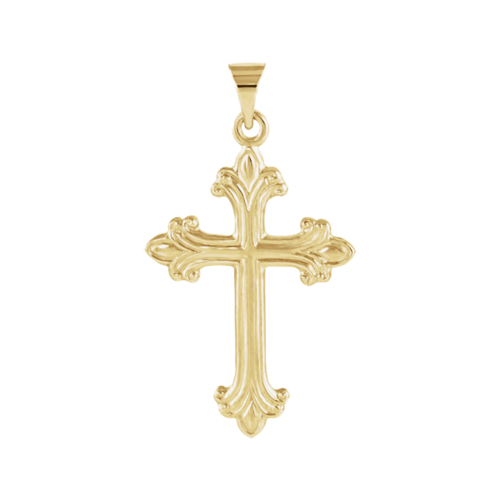 This cross pendant is available in 3 sizes. Very Small measures 11.5mm x 9mm, medium is 16mm x 11.5mm, and the large is 19mm x 15mm. This cross is a hollow design. Grooved Design Cross. 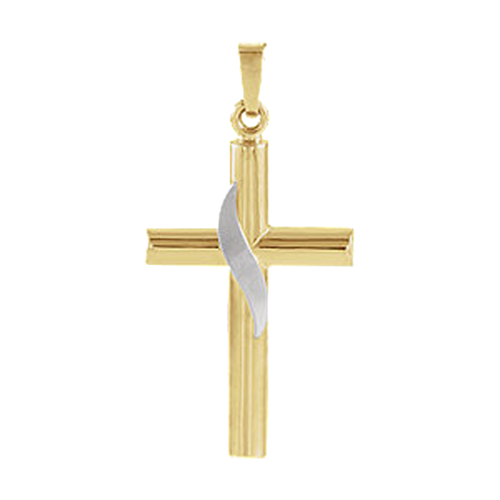 14k Yellow or White gold cross features a unique groove design and measures 24mm by 16.5mm. 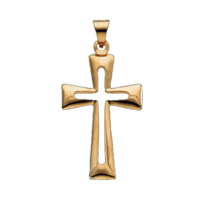 This unique gold cross has a flair of it's own. 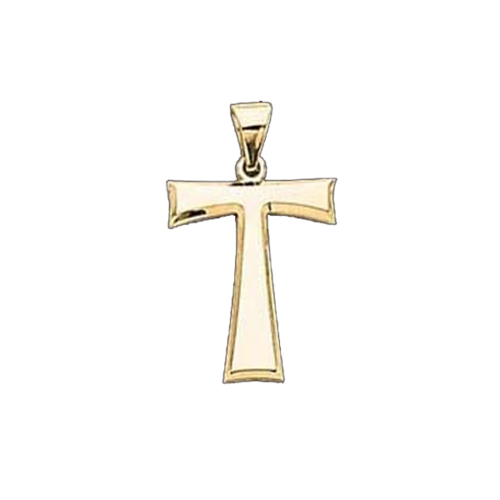 Wear this symbol of faith everyday, it may bring you peace. Double Design Cross. Beautiful 14K White or Yellow Gold. Cross is a solid design with a flat polished back. Available in 3 sizes 19x13mm, (small) 23.5x15.5mm, (med.) and 29x19.5mm (large). Keep in mind 25mm=1 inch. 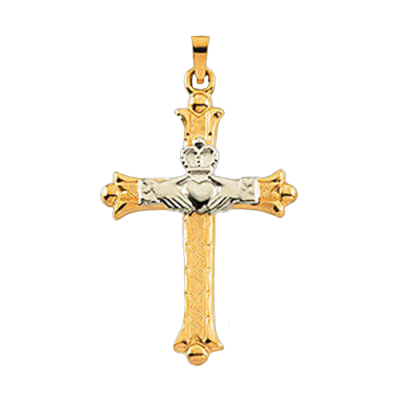 Cross Frame Pendant. 14K Yellow or White Gold Cross Frame measures 27.5mm in length by 18mm in width. Now available in Platinum also. 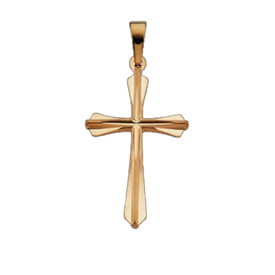 This cross design is very simple yet a great symbol of your faith. Suggested 14k gold box chain measures .50mm in width, suggested Platinum cable chain is a .90mm chain. Claddagh Two Tone Cross. 14k Gold Claddagh cross measures 32.5mm x 23.5mm (25mm - 1 inch). Life often sends us waves of doubt, trials or hard times. 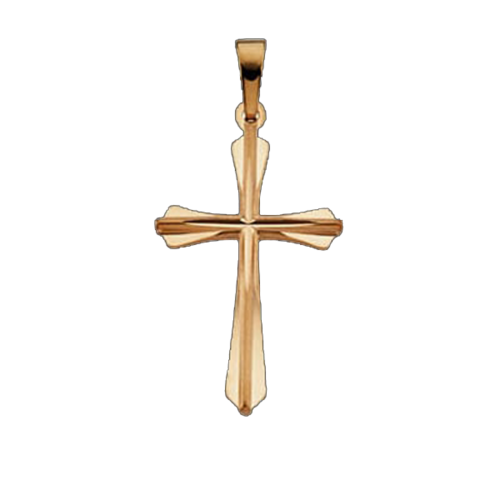 Sometimes it helps to have a beautiful gold cross as a little reminder that your faith will see you through. The Claddagh of course is a unique Irish symbol of love and friendship. 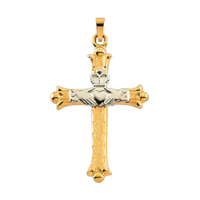 Need a chain to go with this cross, a couple are listed for your convenience, if you prefer a different pendant chain style we have a large chain collection to choose from. Listed below are a few suggested chains. Angle Cross. 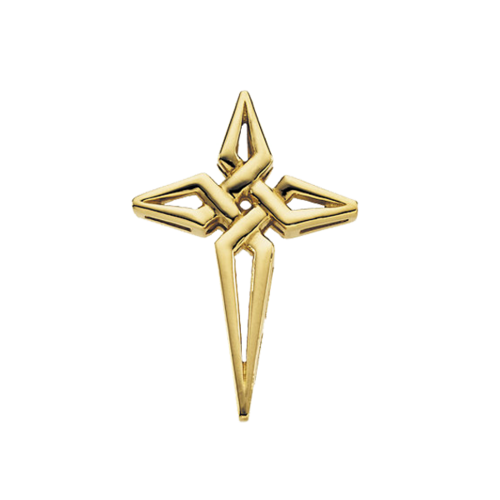 Interesting 14K Gold Angle Design Cross available in White or Yellow Gold. Measures 29mmx21mm (25mm=1 inch). Weighs 3.09 grams. This modern cross pendant is available in any metal choice including Platinum, simply email for additional pricing.